The space: Utilitarian yet elegant – with a light bohemian touch – the Robin Rice Gallery looks like the old West Village, when artists could actually afford the rent in this neighborhood. Pane-glass windows give way to a simple, hardwood-floor space hung with contemporary photography. Also reminiscent of the old West Village: Gallerist Robin Rice champions emerging artists over established ones, often featuring photographers that nobody’s heard of. Yet. The artist: “Contrary to popular web belief, Cig Harvey is a girl, not a boy.” The first line of Cig Harvey’s bio is much like her photography: The themes are serious, but the execution is playful. The UK-born Harvey, who now lives in Maine, is a successful commercial photographer, with clients including Kate Spade and Ralph Lauren. Harvey brings this glossy, modern aesthetic to spare, melancholic settings – an empty beach, an abandoned, weed-filled basketball court – to create ethereal but honest images that linger in the mind long after you’ve looked away. 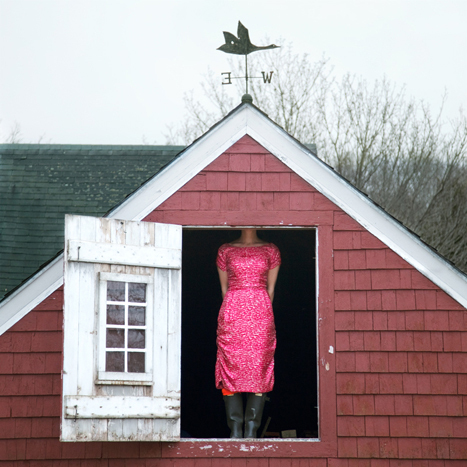 The show: If unrequited love were a color, Cig Harvey has discovered it. Slashes of blood-reds and wasabi-greens define the photographs from Harvey’s new book, You Look at Me Like an Emergency, which is headlining the gallery starting on November 14. Love, heartache, and hope emerge in images like White Witch Moth. A young girl gazes steadily at the camera, holding the delicately patterned wings of a moth over her mouth. But most powerful are the photos where the story is left unsaid: A piece of paper unfurls out of an old-fashioned typewriter, in front of a white curtain. The title: Unsent Letter. This post originally appeared on Galavante.